At the moment we are reading ‘Spaces Speak, are you Listening?’ by Barry Blesser and Linda-Ruth Slater. We experience spaces not only by seeing but also by listening. We can navigate a room in the dark, and “hear” the emptiness of a house without furniture. Our experience of music in a concert hall depends on whether we sit in the front row or under the balcony. The unique acoustics of religious spaces acquire symbolic meaning. Social relationships are strongly influenced by the way that space changes sound. 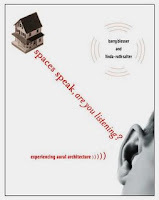 In Spaces Speak, Are You Listening?, Barry Blesser and Linda-Ruth Salter examine auditory spatial awareness: experiencing space by attentive listening. Every environment has an aural architecture. The audible attributes of physical space have always contributed to the fabric of human culture, as demonstrated by prehistoric multimedia cave paintings, classical Greek open-air theaters, Gothic cathedrals, acoustic geography of French villages, modern music reproduction, and virtual spaces in home theaters. Auditory spatial awareness is a prism that reveals a culture’s attitudes toward hearing and space. Some listeners can learn to “see” objects with their ears, but even without training, we can all hear spatial geometry such as an open door or low ceiling. The book is of interest in the way we both perceive and design space in terms of aural experience. Of note is when we take ourselves out of these aural spaces and surround ourselves with our own audio. As we noted in our original post, we view that our perception of urban space is based on sight, smell, sound and to some extent touch. Portable music became main stream in 1979 with the introduction of the Sony Walkman and with it came a change to the way we perceive the space around us. By filtering out the natural and man made sounds of the city we are able to immerses ourselves in a alternative reality of our choosing. You can purchase Spaces Speak, are you Listening?’ from our Digital Urban Amazon Store.